Considering the hellish zoos that airports become when the holidays roll around, taking the train wherever you have to go suddenly seems like the more desirable travel option. The reality, though, is that riding the rails is one of the best and most comfortable ways to see the most beautiful parts of the country any time of year. And now, you have an even better reason to book yourself a trip on Amtrak since the carrier is having a huge sale with tickets as cheap as $13 one way. 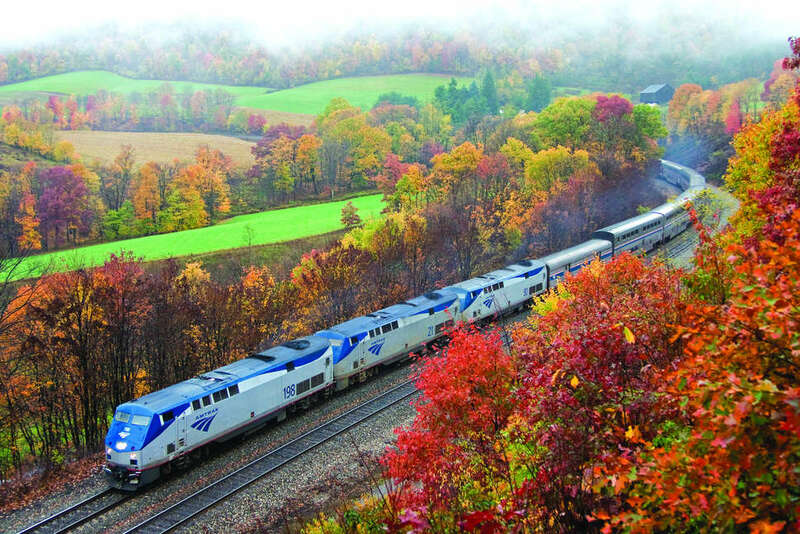 From now through the end of Friday, October 12, the Amtrak Across America sale has deals on a whole slew of popular routes, including some of its most scenic, for up to 30% off. That means, depending where you're headed, you could conceivably get there for as little as $13, and see a whole lot more than a sterile airplane cabin and blue sky while en route. One-way tickets for $13 are currently up for grabs each way on the Texas Eagle route from Chicago to St. Louis (and vice versa), though tickets for a number of other popular and objectively more scenic routes are heavily discounted. For instance, you can take the stunning Coast Starlight line along the Pacific Coast from Los Angeles to Oakland for just $39 each way (Seattle to LA on the same line is just $79). Also, a hop on the Amtrak Cascades from Seattle to Portland will run you a cool $25 each way. There are solid bargains to be had on many other popular routes, so it's worth poking around. Unfortunately for those looking for a cheaper ride on the Acela Express, the sale doesn't apply to those routes. To get in on this, you'll need to travel between November 27 and May 22, 2019, but unlike most airfare sales, there aren't any blackout dates. And sure, a flight will almost always be the faster way to get somewhere, but coach seats on Amtrak are exceedingly comfy and spacious and come with power outlets (not to mention free wifi). Plus, if you're schlepping a lot of baggage, you won't need to pay out the nose for it since Amtrak allows up to bring on up to four for free (two carry-ons, two personal items), and small pets are allowed on trips up to seven hours. Now go forth and ride the rails while basking in the beautiful scenery and smug joy that comes with avoiding the airport.